In spite of the rainy weather we had a great day! 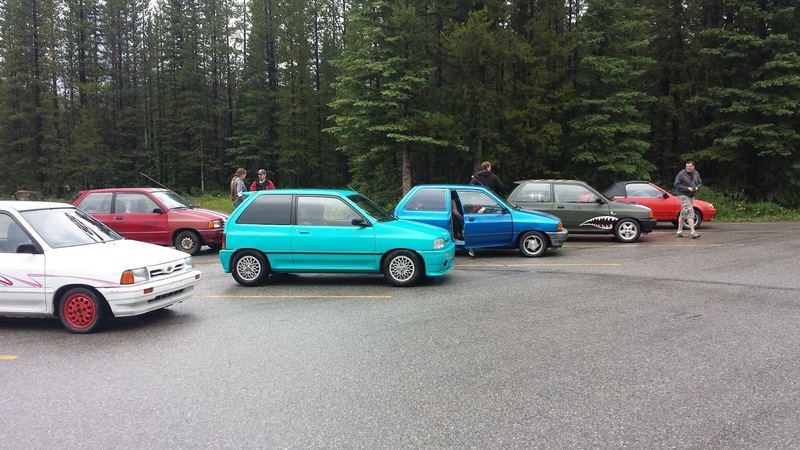 Final tally: five Festivas and one Suzuki Swift convertible. 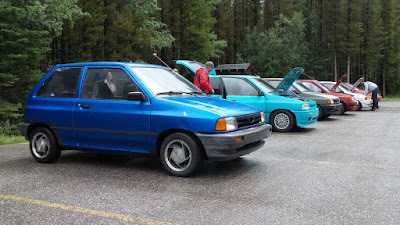 Of the five Festivas only two were stock and only one of those was an automatic. 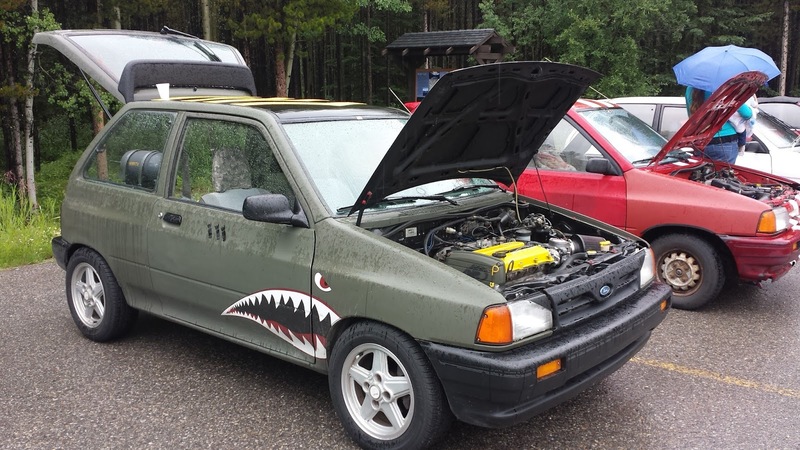 The other three had engine swaps and some other custom work. Even the Swift had some modifications in the engine bay! Joe and his friend Brian drove in from Saskatoon and won the "Long Distance" award, a gift card from RockAuto. Those are not bombs but speaker enclosures! 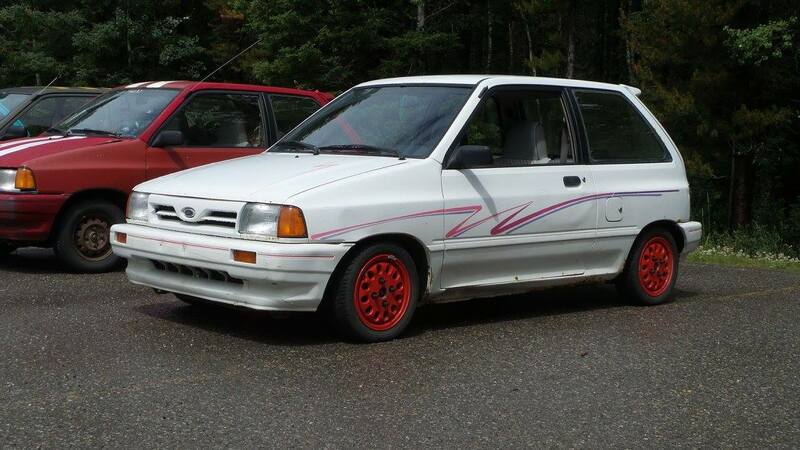 This definitely qualifies as a low budget build. 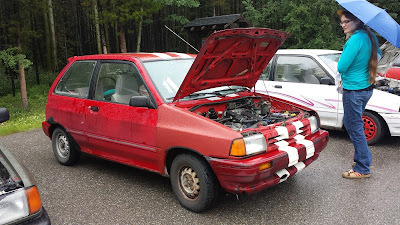 Julian paid less than $200 for the car, sold about $100 worth of parts off it which he put back into the car, then used bit and pieces he had lying around to put it all back together. Net cash out of pocket... $160!! 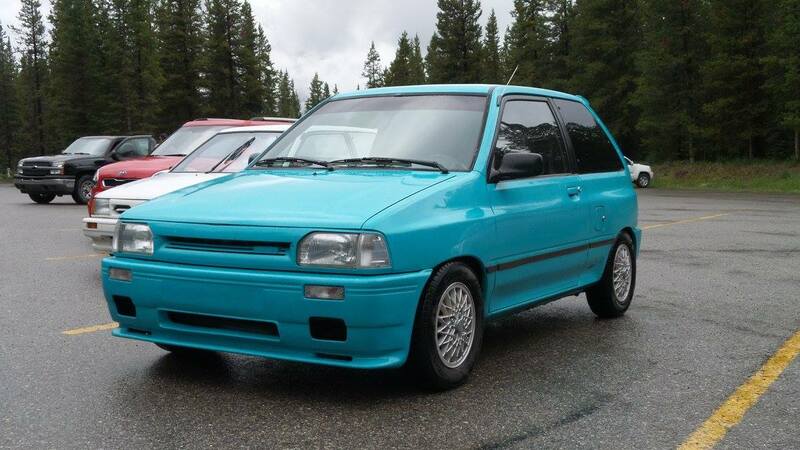 Julian was accompanied by Ryan and his family in their stock '93 Festiva. This car has seen a lot of misfortune over the years that Ryan has owned it but it keeps going strong. They are planning a cross country trip in their Festiva for next year and making some improvements and modifications to make the trip a little more comfortable. 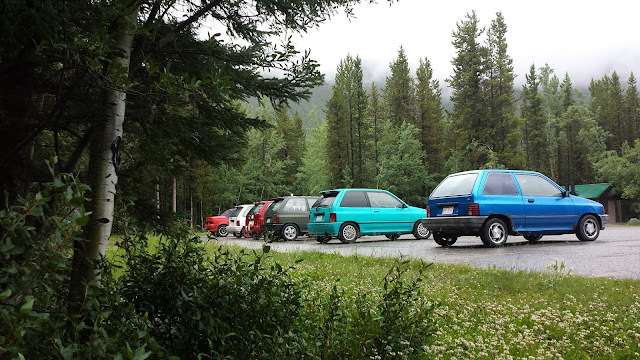 Next to arrive was Sara, a family friend, in her '93 Festiva with automatic transmission. 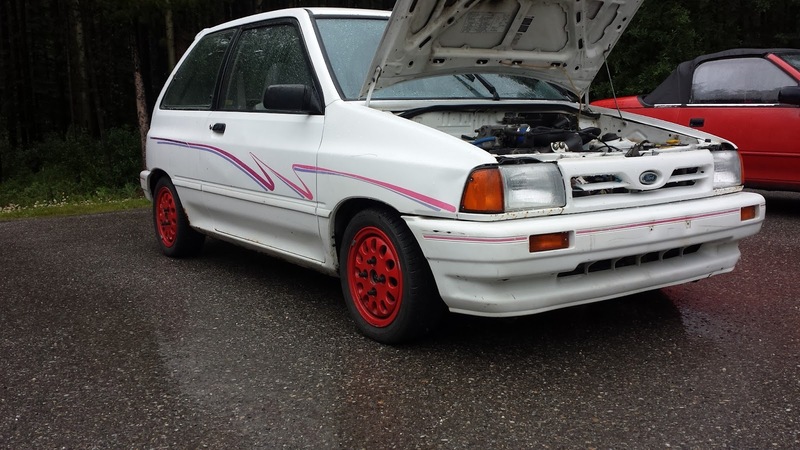 Other than the aftermarket wheels this car is stock. 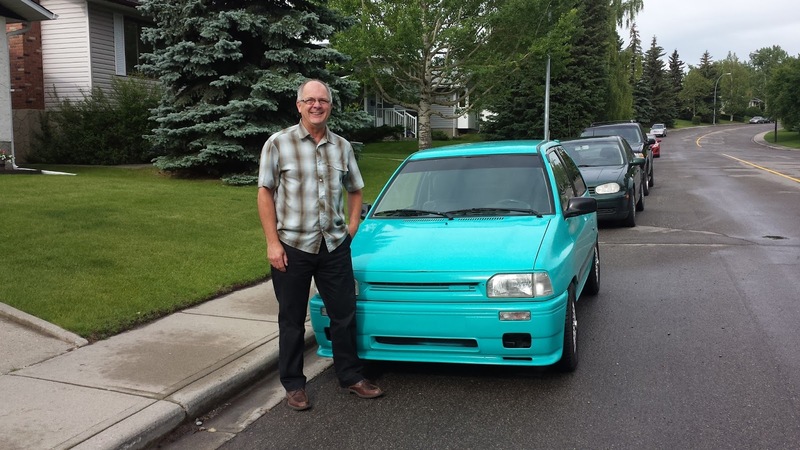 Our special guest this year was Drew from Calgary in his Suzuki Swift convertible. 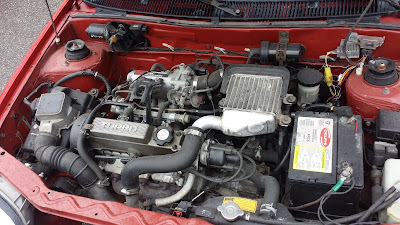 The engine bay features a 1.0l 3 cylinder turbocharged engine which I believe was sourced from a Swift GTI, as were the wheels. I had my B6T Festiva there as well of course. You can go to this page if you would like to learn more about it. A Westiva regular call me in the morning to say that he wasn't able to join us and the gentleman I was expecting from Macon, Georgia had to cancel at the last minute. Met some new friends, lots of car talk, great ice cream... all in all a great day. Looking forward to Westiva 2017 already. Thanks to RockAuto.com for providing some giveaways and the gift card that was used for the long distance award. Thanks also to Rallysport.ca for making the Westiva 2016 stickers for us. Thanks most of all to all those that were able to join us on a rainy day. Comments and questions would be greatly appreciated... use the space below. It's been an exciting couple of days for us! The producers of a local radio show, Calgary Eyeopener on CBC Radio 1, contacted me and that discussion led to a live in studio interview on Wednesday morning! That interview resulted in a follow up article on cbc.ca later in the day. A writer for a local newspaper heard the segment and gave me a call which resulted in an article in today's edition of the Calgary Metro paper. Getting even more excited about the day. Thanks to the Calgary Eyeopener crew and to Brodie Thomas at Metro News for promoting our little event! Here's a blog post on "The Truth About Cars" that resulted from the Metro News article! You never know who's going to find you. Westiva is only a few days away! Only a few days left until Westiva (details in the featured post). Looking forward to reconnecting with long time friends and meeting new ones. Should be an interesting day. There will be at least three Festivas there with different engine swaps, ours with the Mazda 1.6l DOHC turbo, one with a Mazda 1.8l DOHC and another with a 1.6l SOHC. One of our regular attendees will be there with the 1990 Festiva LX he bought new and still drives almost every day.